I love the subtle elegance of white and silvery winter decor. When I took down my Christmas wreath in January, I knew I wanted to do something pretty and classic that would last through the rest of winter. 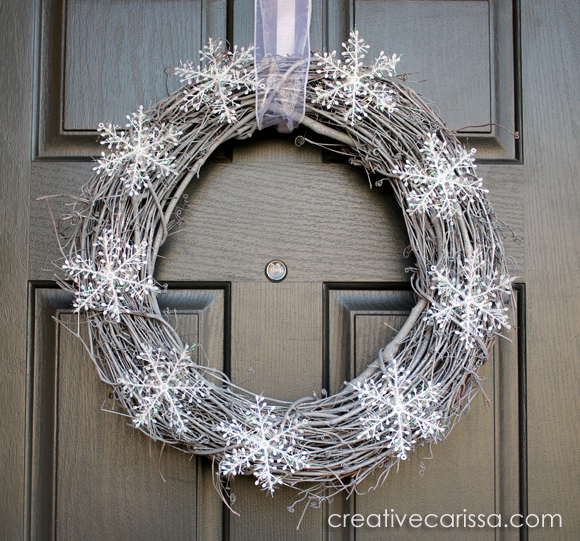 This pretty DIY winter wreath featuring snowflakes was my answer! 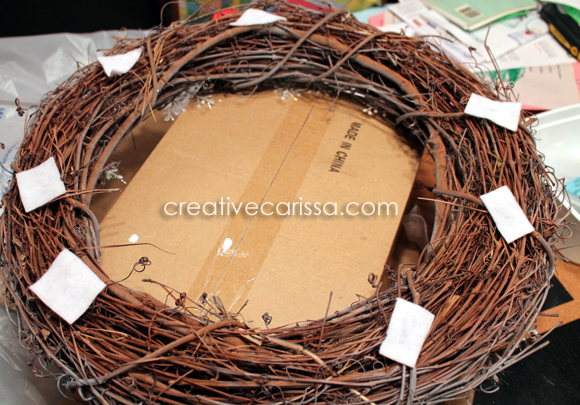 To make it, I upcycled a grapevine style wreath I had from a previous project. 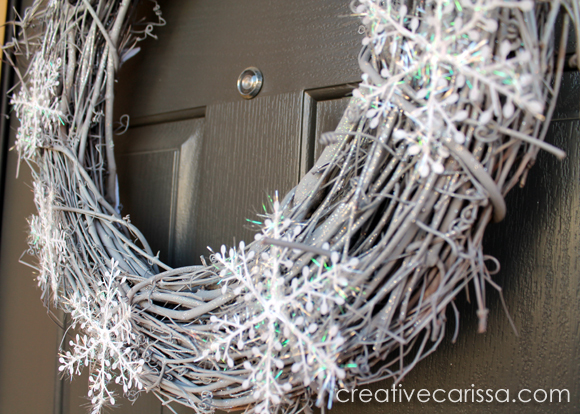 By giving the rustic wreath an update with paint, glitter and repurposed snowflake ornaments I had on hand I got a pretty winter wreath for free! 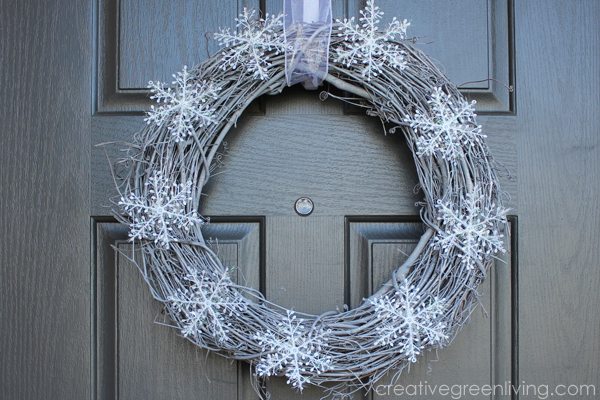 This pretty snowy wreath will fit all style of decor including rustic, lodge and farmhouse. If you decide to make this wreath, won't you share? 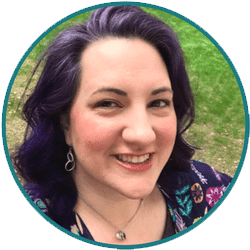 I'd love to have you share photos of your wreaths in the Creative Green Living Tribe group on Facebook or post it on Instagram and tag @CreativeGreenLiving. Some of the links below may be affiliate links where a purchase made after clicking will support this website without costing you extra. 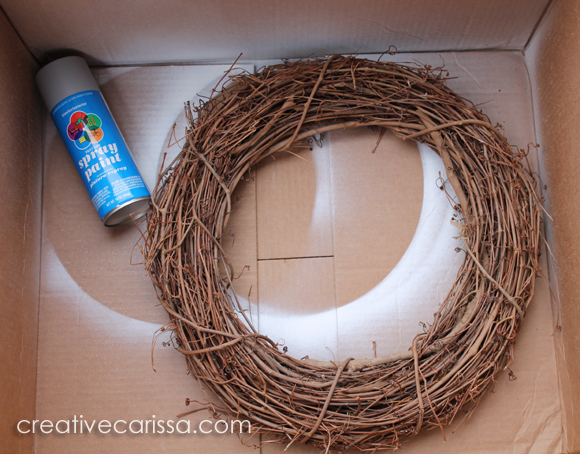 I brought my wreath outside in a large box to paint it without getting paint everywhere. 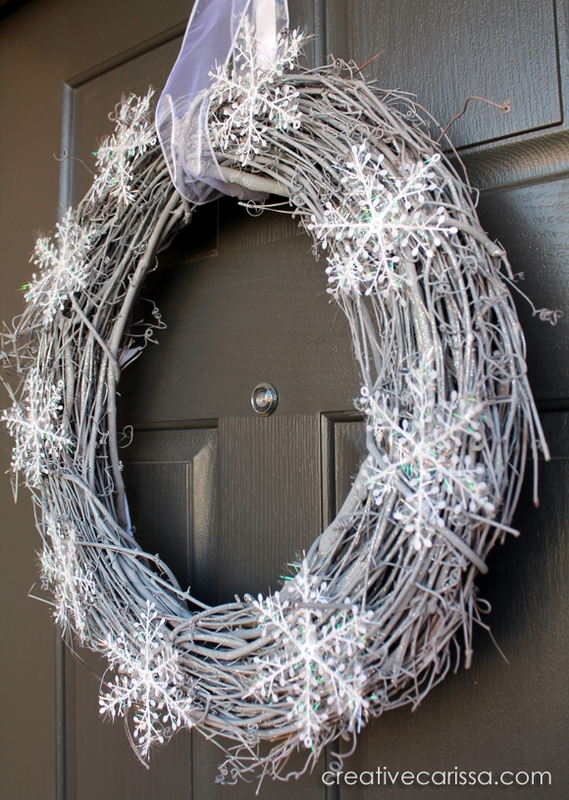 While the paint is still wet, dust the wreath with glitter. I used a combination of fine silver and fine clear/white glitter. Allow the wreath to dry. Keep in mind that spray paint usually sets best between 60 - 90 degrees (check your can of paint for brand-specifics). 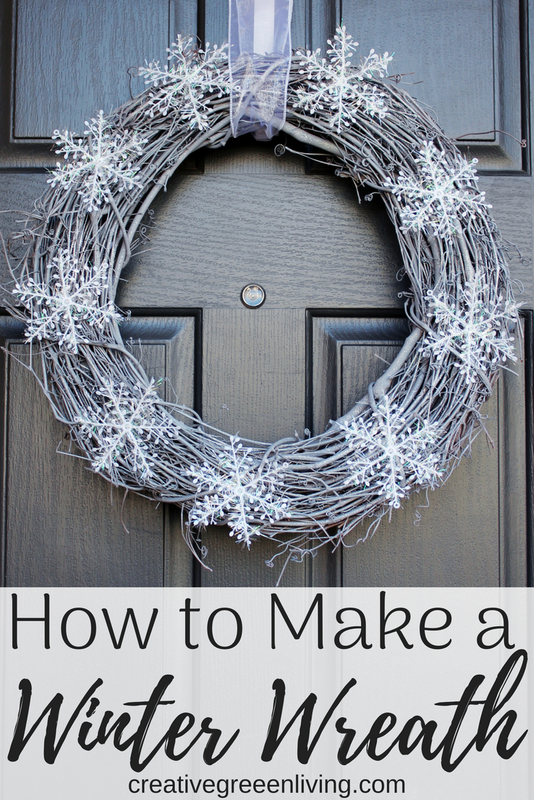 If you are making this project during a time of year that it is colder than 60 degrees outside, you will want to bring your painted wreath into the garage or a well ventilated room (like a bathroom with a fan running and window cracked) to dry. 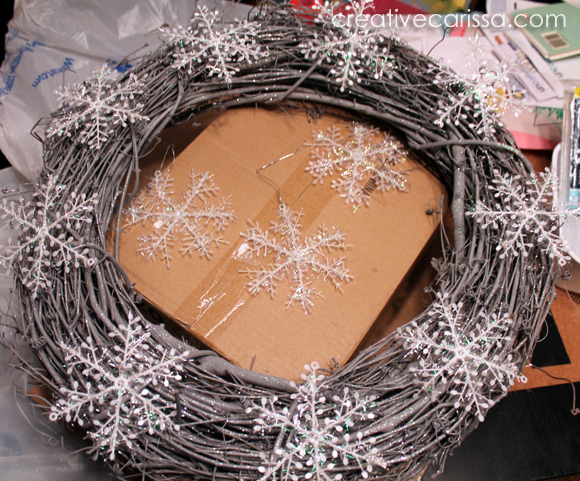 Arrange the snowflakes around the wreath and attach them with hot glue. 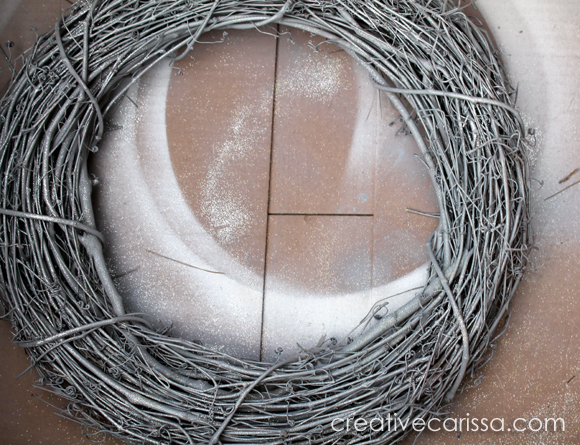 I like to add felt pads to the back of grapevine wreaths as I find the sticks have a tendency to scratch my door. Just use your hot glue to attach some felt pads on high or particularly scratchy spots. I like the look of organza ribbon for hanging my winter wreaths. Due to the delicate nature of the ribbon, you will need to use this hack to make it look like the ribbon is holding it. Use a metal wreath hanger to hold the weight of the wreath but loop the organza ribbon through the wreath to look pretty. I just attach the ribbon the backside of the door with a dot of hot glue that can peel off later. If you love this project, save it for later! I love this! I have been looking for a winter wreath-thanks.